Students at a Miami high school are grieving the Labor Day shooting death of a 17-year-old classmate. Maurice Harris, who attended Miami Northwestern High School, was killed in one of two fatal shootings Monday night. Early Monday, Miami-Dade Schools Superintendent Alberto Carvalho expressed his grief over the loss of one of his students. "Once again, we wake in mournful prayer for a Northwestern junior who fell to the murderous bullets of our community's heartless cowards," Carvalho tweeted. "Sadly, not everyone of our kids gets to see today's rising sun. Overnight murderous violence has claimed one more child in our 'Magic City?'" Maurice Harris, a junior at Miami Northwestern High School, was killed in a shooting in Miami. 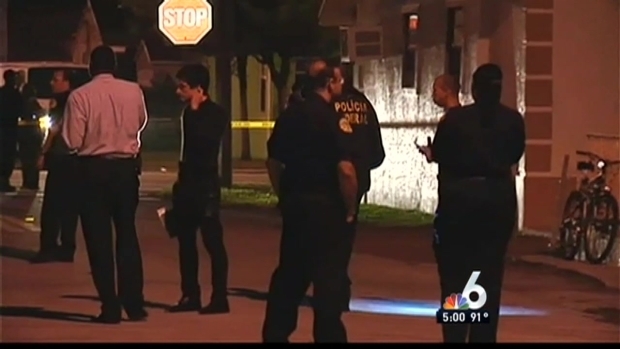 The two shootings happened just hours apart and within blocks of each other near Northwest 13th Avenue between 27th and 54th Street. The other shooting claimed the life of a 66-year-old man. The 17-year-old was shot multiple times and taken to Jackson Memorial Hospital where he later died. "My family is very tormented, we're just in disbelief, we're heartbroken, very heartbroken," Harris' cousin, Arnica Perez, said. "He had a bright future ahead of him and he was a very lovable boy." Monday's shooting was just the latest tragedy for the family. Three years ago, Harris' father, Maurice Harris Sr., was gunned down while defending his family during a home invasion. The family had moved to Orlando and had recently moved back to Miami. Harris had just enrolled at Northwestern and had been there for only a week. Police don't believe the shootings are related and no arrests have been made. On Tuesday evening, a man was grazed in the head by a bullet in the same area as the teen was shot and killed. He was later found trying to drive himself to the hospital. Police don't believe he was the intended victim. There's no word on whether the two shootings were connected.